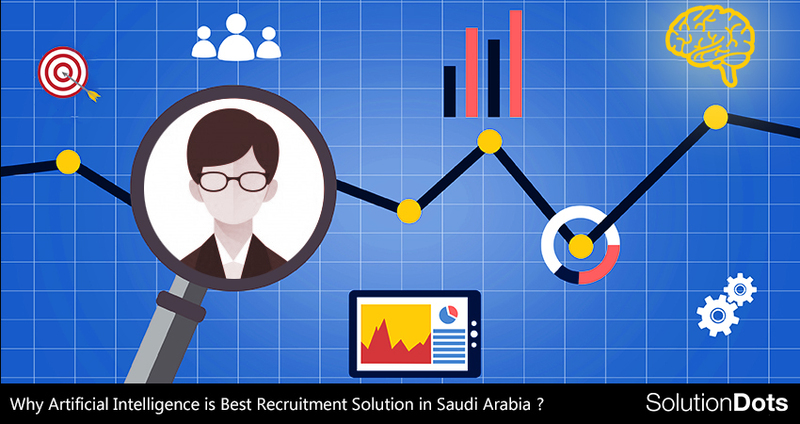 Why Artificial Intelligence is Best Recruitment Solution in Saudi Arabia? Are you seeking around for a reliable recruitment tool for your business? No more need to consume time in a search here and there but artificial intelligence (AI). AI is offering ideal solutions for recruitment, resource management and other processes of the small business. Every small business owner wants to hire the best candidates but still, it is almost impossible to review every resume separately at the time to opening. Having not a streamlined approach to search perfect candidates is quite disappointing. Therefore, you’ve to make a process that enables easy candidate access and research for the best to meet expectations. Technology is continued to provide solutions but AI is one of the ideal resolutions. These solutions enable easy access through proper criteria in the form of resume screening, and online assessments. Let’s suppose you’re hiring multiple candidates at the same time, interference of AI is going to support you as a blessing. Artificial intelligence is helping in improving the hiring decisions for a variety of companies and on the other hand also enhance candidate’s experience. Furthermore, AI can simply eliminate the effort of search and separate irrelevant information. It can easily ignore all irrelevant data and automatically recognize real-time information. A well-organized research process is going to ensure organizational success. Applicant tracking module is a tool that supports in filtering resumes according to the keywords. There are a lot of businesses using this module to simplify their hiring tasks. They can simply search and sort resume according to keywords and can immediately access if needed. However, ATS let the applicants simply craft their resume by inserting right keywords so, they’ll be easily searched and ranked. This is a disadvantage too, if you’re are interviewing a candidate who is dishonest and just ranked their profile or resume with keywords support. You’ll waste your time as well as money if they got hired. Artificial intelligence (AI) collaboration software can easily pull up all data from a variety of sources to access perfect candidates. In simple words, this is going to be an excellent approach to access data related to candidates through different online tools including social platforms. It secures recruiter’s time and organizational investment. Once you’ve received a complete list of candidates (the one who are probably perfect for the job), now the next step is to connect or communicate in different ways. You have to connect them through email or by making the call. This is a time to get yourself prepared with prescreening questions. So, AI is offering a solution in the form of chatbots. They’re liable to perform prescreening test/interview on your behalf. This is going to be an ideal solution to integrate such bots for with an ATS tool. The questions should be well-planned and organized according to the provided information and job opportunity. Passive candidates are the ones who’re interested in finding a good opportunity but haven’t started the search process. They might already hold good positions because they’re highly qualified but there are a variety of reasons behind their dissatisfaction. AI passive candidates analyzing tool enable in find them through different factors. It can keep the passive candidates engaged as like the other ones. Such candidates can be found on different professional websites. Keeping them all engaged and identifying their influence is essential to encourage a good workplace environment and ensure growing opportunities. Engaging candidates and improve communication leads towards interview scheduling. Integration of right tools direct towards setting up meetings according to time and date comfortability. Artificial intelligence (AI) has required to raise machine learning for human resource managers and SMBs owners. They need to stay up-to-date in order to hire the best candidates for their organization. If you’re in developing environment, AI shouldn’t be just a tool for your company but a game changer. You can be more focused on the interpersonal skills of candidates during the interview and get the best out of them.